Maple sugar is sugar that is produced when you cook down the sap of a maple tree past the point of being maple syrup, until it has almost no liquid and you are left with sandy crystals. It is an intensely flavorful ingredient and can be a lot of fun to work with – especially if you are a maple syrup fan in general. Maple sugar can be used much like regular sugar, but it is almost twice as sweet, so you need to take that into account when putting together a recipe that uses it. 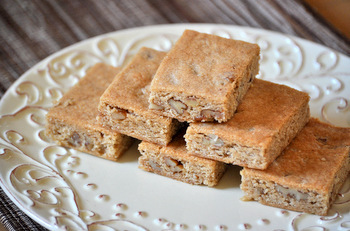 These Maple Sugar Pecan Bars are made with maple sugar instead of regular granulated sugar. Maple sugar gives them intense maple flavor and makes the bars taste a lot like french toast. To compensate for the sweetness of the sugar in this particular recipe, I added a little extra salt to cut that sweetness and used salted pecans in the mix, too. The result is a bar cookie that is sweet, but balanced, and delivers a powerful burst of maple flavor that maple fans will love. These bars are chewy and cake-like, but are moister and more dense than cake. They don’t have the same fudgy texture that a blondie does, which makes them a little lighter. They’re perfect when served with coffee or tea, but can make a tasty snack any time. The pecans add a welcome crunch to the bars, and if you use some spiced pecans, you’ll get an extra layer of flavor, although walnuts would also be an excellent option and make a nice pairing with maple. I typically stick with salted nuts in a recipe like this one because the sweet maple flavor is strong and the salted pecans stand up to it especially well. Preheat oven to 350F. Line an 8 or 9 inch square pan with aluminum foil. In a large bowl, cream together butter and maple sugar until light. Beat in egg and vanilla until well blended. Stir in flour and salt, then mix in chopped pecans. Spread dough evenly in prepared pan. Bake for 23-28 minutes, until top is a light golden brown and bars are set in the center (9-inch pans will require a baking time on the short end of the spectrum). Cool in the pan, and use the foil to remove the bars for easy slicing.